Hacktivists from the online group Anonymous have turned their attention to Yemen as part of their battle for greater net freedoms. 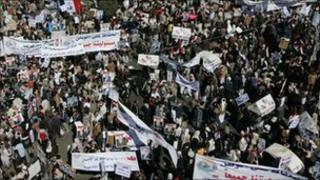 The website of President Ali Abdullah Saleh has become inaccessible as Yemenis stage anti-government protests. It follows attacks on the websites of Egypt's ruling party and ministry of information this week. Last month Anonymous shut down some Tunisian websites, including the government's official site. Anonymous's move into Middle East politics has alarmed security experts, who warn people against jumping on the bandwagon. "If you participate in these attacks, you are knowingly engaging in a cyber crime," said Graham Cluley, a senior technology consultant for security firm Sophos. "If you aren't prepared to go and throw rocks, then maybe you should think again about clogging up websites with traffic," he added. There have been five arrests in UK and the FBI launched raids across the US in connection with the Wikileaks cyber attacks, which saw members of Anonymous targeting firms which had withdrawn services from the whistle-blowing site. Anonymous claims that it wants to uphold web freedoms around the world but as such attacks increase, it could have knock-on effect of governments seeking to make it harder to remain anonymous online, thinks Mr Cluley. "If there was no ability for anonymity, we would all be the losers," he said.